Travelling abroad this summer? 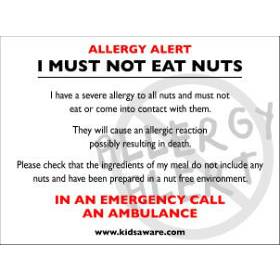 Choose from our Food Allergy Translation cards to help keep you safe. Hand to restaurant staff to ensure they understand your allergies and dietary requirements. Please contact us if you require customisation as we can accommodate certain languages. A Food Allergy Translation card is an essential aid to help keep you safe when travelling abroad with allergies. Hand to restaurant staff to ensure they understand your allergies and dietary requirements. Allergy Alert in English on one side with the translation on reverse. Available for French, Spanish, Portuguese, Italian, Greek, Croatian, German, Danish, Dutch and Finnish. Useful in hotels and restaurants when travelling abroad. The card is laminated to keep it clean and dry. A lot of money for what it is! Just been typed out on a piece of paper then laminated! I could of done this and saved myself a small fortune. Thank you for your feedback. I’m sorry to hear that you are not happy with your translation card. The cost of the translation card is linked to the high cost of certified translation services. We get all of our translations done by a certified company. The translations go into detail about cross contamination also to ensure the server knows the importance of making sure the meal is free from nuts. The card is laminated as we personalise and print them specifically for each customer to include all of the foods they are allergic to. Really disappointed with this. Very expensive for a piece of laminated card. Took 16 days to arrive by which time my son had left for his school French trip. Translation card was great, takes away the uncertainty when ordering in restaurants as to whether you are being fully understood . My daughter can travel to France with her school while I have peace of mind, brilliant.